Among the interplay of Saturn's shadow and rings, Mimas, which appears in the lower-right corner of the image, orbits Saturn as a set of the ever-intriguing spokes appear in the B ring. One of Saturn's iconic rings looks much different today than it did just a few decades ago, and scientists aren't sure why. NASA's twin Voyager spacecraft spotted many bright clumps in Saturn's F ring when they flew by the gas giant in the early 1980s. But observations made by the space agency's Cassini probe from 2004 to 2010 reveal relatively few of the features, a new study reports. French and his team have a hypothesis that could explain what's going on, and it's tied to the number of Saturn "moonlets" found near the F ring over the decades. The researchers think these tiny satellites, which are less than 3 miles (5 kilometers) wide, create the bright clumps when they plow into the densest parts of the F ring. Therefore, the drop in bright clumps may indicate a big decrease in the number of moonlets, the researchers said. But why would the moonlets be more common in the Voyager era than in the time of Cassini? It may have to do with periodic alignments of Saturn's 84-mile-long (135 km) moon Prometheus and the F ring, researchers said. Both the F ring and Prometheus lie near Saturn's Roche limit — the orbital distance within which the gas giant's powerful gravity rips small objects apart. 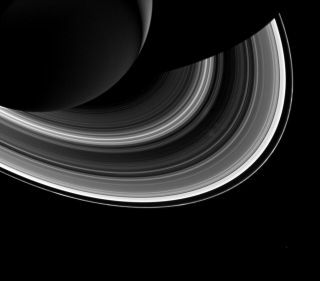 "Material at this distance from Saturn can't decide whether it wants to remain as a ring or coalesce to form a moon," French said. Prometheus' gravitational pull contributes to the chaos, sometimes spurring the generation of new moonlets and sometimes sending the little satellites to their doom, researchers said. Prometheus' role in this regard is especially strong once every 17 years, thanks to a regular alignment in the orbits of the moon and the F ring. The research team thinks this periodic alignment may lead to the generation of lots of moonlets, which would, in turn, produce many of the mysterious F-ring bright clumps. These clumps would fade over time, the researchers explained, because repeated collisions with ring material would eventually destroy the moonlets. "Cassini's continued presence at Saturn gives us an interesting opportunity to test this prediction," said Cassini project scientist Linda Spilker, of NASA's Jet Propulsion Laboratory in Pasadena, California, who did not participate in the study. "Whatever the result, we're certain to learn something valuable about how rings, as well as planets and moons, form and evolve." The new study was published in July in the journal Icarus.